Sonar was, and still is, the primary means for locating submerged submarines. It relies on the fact that water is a good conductor of sound energy (much better than air) and that the steel hull of a submarine is an excellent reflector of sound. The word sonar originally referred specifically to what is now called active sonar. This was preceded by passive sonar or sound detection, which used sensitive hydrophones (underwater microphones) to detect the noise generated by the engines and screws of a submarine. A suitable directional hydrophone or set of hydrophones could determine the bearing to the submarine. Determining the distance is more difficult, typically requiring knowledge of the surface ship's course and speed and some guesswork regarding the submarine's course and speed. The fact that most surface escorts moved at a higher speed than most submerged submarines helped, but it was still difficult to determine the range with enough accuracy to score a kill with the very short-range antisubmarine weapons available, such as depth charges. Active sonar overcame this difficulty, because it is possible to accurately measure how long it takes for a powerful sound pulse to travel from the surface ship to the submarine, be reflected, and arrive back at the surface ship. Both the British and French navies investigated active and passive sonar during the First World War, when the German U-boat force came close to starving out Britain. However, only the passive systems were ready in time for operational use in the war. The United States developed active sonar technology between the wars, and U.S. researchers were the first to call it sonar, by analogy to the word radar. The British referred to their systems as ASDIC, a code term going back to the First World War. Detecting a submarine with hydrophones was quite difficult, and detecting it with sonar was all but but impossible. Sonar was highly directional. This allowed sonar to get a good bearing on its target, but it also limited the usefulness of sonar for search, since it took several seconds to listen for a return on a single bearing. The sonars of the Pacific War were thus fire control systems rather than search systems, with effective search sonars not becoming available until 1946. Range was also limited, rarely exceeding 3000 yards (2700m) even under the most favorable conditions. Sonar was generally ineffective at speeds over about 10 knots, requiring "sprint and drift" tactics in which the antisubmarine warship had to periodically slow almost to a stop to make best use of its sonar. Sonar could not determine depth with any accuracy and was unable to track a target immediately underneath it. Thus, a submarine could sometimes evade a depth charge attack by maneuvering sharply just as the attacker passed overhead and lost sonar contact. The depth charge explosions themselves blinded sonar, and a submarine that survived a depth charge attack could sometimes break contact behind the "wall" of sonar interference created by the depth charges. The British developed the "creeping attack" to overcome these deficiencies. One antisubmarine ship would maintain sonar contact with the sub while guiding a second antisubmarine ship that closed in at low speed with its own active sonar turned off. This form of attack was extremely difficult for the submarine to evade. An important technology associated with sonar was the device the British called the chemical recorder. This was a rotating drum of chemically treated paper with a stylus, resembling nothing so much as a modern seismograph. The rotations of the drum were synchronized with the pings from an active sonar set, and the stylus was connected to the receiver and twitched when an echo was received. The result was a series of marks on the paper that allowed the operator to directly read off the range rate and estimate the change of range rate. This greatly improved antisubmarine fire control. Prior to the chemical recorder, the basic antisubmarine tactic was to rush to the last contact point, drop lots of depth charges, and wish for luck. The ability to predict the submarine's motion contributed to the effectiveness of the creeping attack. It also allowed much slower (and more cheaply constructed) ships to carry out effective antisubmarine attacks. Later in the war, high-frequency sonar was developed that was capable of detecting objects as small as contact mines. This was coupled to frequency modulation (FM) that allowed the sonar to carry out an effective short-range search. The sound beam swept a range of frequency as it swept in bearing, so that the bearing of a return signal could be determined by its frequency alone. Thus a nondirectional hydrophone could be used for the return signal, avoiding the need to pause at each bearing to wait for the return. Such sonar was fitted to American submarines towards the end of the war, which allowed them to penetrate minefields protecting the Sea of Japan. This was a considerable shock to the Japanese, who had assumed that the Sea of Japan was a safe haven for their merchant shipping. Midway through the war, the United States developed the sonobuoy, a small battery-powered sonar that could be dropped from an aircraft on the suspected location of a submarine and radio its findings to the aircraft. One account claims that Navy Liberators were equipped with sonobuoys as early as March 1943 (Simons 2012). Another claims that a sonobuoy was used during the hunt for U-575 in the Atlantic on 13 March 1944 (Roscoe 1953). However, early sonobuoys were plagued with difficulties with background noise, and the device did not get into operational service in time to be decisive in either the Atlantic or Pacific. Sonar would find significant employment postwar as a sounding device to determine water depth under the keel of a ship, but the military sonars of the Pacific War were not designed with this capability. However, sonar was occasionally used to locate reefs, as at Cape Gloucester. The British made some use of defensive sonar, which was intended to detect an incoming torpedo at sufficient range to allow evasive maneuvers. A number of Type 132 and Type 149 sets were fitted to cruisers and a few battleships and aircraft carriers, while Type 136 was fitted to fast merchant ships. The Germans developed the pillenwerfer ("pill thrower") as a countermeasure against sonar. This was a system that ejected a canister of calcium hydride from the submarine. The calcium hydride reacted with sea water to produce large volumes of hydrogen bubbles that produced a false sonar target. Allied sonar operators claimed that this false sonar target could easily be distinguished from a real target by an experienced sonar operator; for example, there was no Doppler shift in the tone of the return ping like that from a moving submarine. Nevertheless, the Americans had duplicated the system by 1945 and made use of it in the submarine offensive in the Pacific. American sailors tended to use the word pillenwerfer to describe the canisters themselves rather than the ejection system. Another sonar countermeasure was the bathythermograph, which was perfected by the Americans during the war. This recorded a plot of water temperature versus depth on a smoked card. Though messy, the BT allowed a skilled commander to identify water conditions where a "layer", a sharp gradient in water temperature, refracted sonar waves and thereby degraded sonar performance. American subs would dive to maximum depth each morning to record the temperature profile for later tactical use. In principle, sonar could be jammed if the target sent out its own pings timed to confuse fire control systems. Raby reported that a submarine target (later identified as Ro-104) successfully jammed its sonar on 23 May 1944, but it seems likely that an experienced sonar operator would have little difficulty distinguishing his own pings from those of a foreign sonar transmitter. In 1939, the U.S. Navy established two Sound Schools, one at New London, Connecticutt, and the other at San Diego, to train sonar operators. The West Coast Sound School eventually had facilities to train 1200 sonar operators at a time. Frequency. The frequency was an important indicator of a sonar's capability. High-frequency sonar had limited range but could detect small objects such as mines. 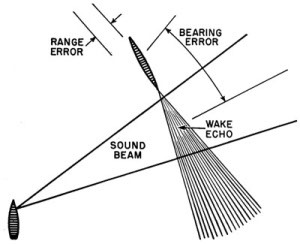 Search sonar, which was just beginning to be introduced at the end of the war, swept a range of frequencies to permit discrimination of returns from different bearings. Pulse width. This is the duration of a single ping from a sonar transmitter. The shorter the pulse width, the better the distance resolution. However, achieving a short pulse width is technically challenging, and it is more difficult to put a lot of power into a very short ping. Search sonar did not transmit a ping, but swept continuously in frequency as it swept in bearing. Power. This is the average transmitted power. The greater the power, the greater the sensitivity of the sonar. Range. This is the distance at which a submarine will typically be acquired from a sonar platform moving at 5 knots. Range begins to degrade significantly when the sonar platform's speed reaches ten knots, or in rough seas. The detection range is also affected by such factors as the depth of the submarine relative to the oceanic thermal profile, the size of the submarine, and the presence of an anechoic coating on the submarine. Accuracy: This is a measure of how precisely the direction and range of a target can be determined.